Editor's note: An earlier version of this story contained an incorrect title for TrueCar President John Krafcik. Yes, January's U.S. sales numbers were superb and not just in comparison with the first month of 2014, when much of America was snowbound. It was the best January since long before the recession as new light-vehicle sales rose 14 percent to 1,152,480. But it was not a record. What was a record was all the revenue those sales generated for the industry. The car business is awash in cash. With the lift-off of the luxury, SUV and crossover segments, average transaction prices have been climbing steadily -- and just got a big boost with the collapse of gasoline prices. Carmakers can expect the run-up in revenue to continue in 2015. TrueCar President John Krafcik forecasts a 2.8 percent gain in unit sales to 17 million this year, slightly above the industry consensus of 16.9 million. But he says revenue will rise 4.8 percent to $553 billion. "That additional revenue is great for automakers," Krafcik said. The surge of cash fuels profits, investment capital and product development resources leading to "the flurry of attractive new products hitting the market." Last month's higher transaction prices -- what buyers pay after incentives are applied -- came with a 16.7 million annual selling rate, which was up from 15.3 million a year before. General Motors led the major players in January with an 18 percent sales increase. "Demand for trucks and crossovers is really driving our business," said GM sales boss Kurt McNeil. He described GM's launch of the Chevrolet Colorado and GMC Canyon midsize pickups last fall and its entry into the small-crossover market with the Buick Encore and Chevy Trax as "well-timed." Last month, the truck boom helped drive GM's average transaction price per vehicle up $2,400 from a year earlier, to $34,800 through Jan. 25, according to GM. Ford F-series pickup sales jumped 17 percent in January, and the company's overall sales increased 16 percent. Transaction prices for the F-series lineup, including Super Duty models, were up by $2,100 a unit from a year ago, said Erich Merkle, Ford's chief sales analyst. The new-generation aluminum-body 2015 F-150 sold for an average $51,354 while leftover 2014 models averaged $40,406, according to TrueCar. Of F-150 sales in January, Ford said 18 percent were of the new, aluminum-bodied pickups. Combined, TrueCar said, average transaction prices for domestic-brand full-size pickups hit $42,126 in January, up by $1,412 from a year earlier. Across all segments, TrueCar said, the average January price was $32,812, or 3.5 percent above the same month last year. And, combined, the 14 percent unit-sales growth and higher prices lifted net revenue across the industry 17 percent to $37.6 billion in a traditionally slow month. The same combination has helped automakers recover financially since the low point of the Great Recession. From 2009 to 2014, unit sales rose 58 percent for the U.S. industry. And average transaction prices climbed 13 percent to $31,916 from $28,122, according to TrueCar. As a result, it said, new-vehicle revenue soared 80 percent, to $527 billion last year from $292 billion in 2009. Kelley Blue Book said new-vehicle transaction prices in January jumped 5.2 percent over January 2014 to an average of $33,993. "Lower gas prices are helping what has already been a growing market for truck and utility vehicles," said Kelley analyst Alec Gutierrez. "In turn, these vehicles are driving increases in average transaction prices across the industry, especially among the domestic automakers." The revenue growth largely comes from a richer product mix and consumers buying a richer mix of features and equipment. Since 2009, TrueCar said, nonluxury cars' popularity has waned while nonluxury SUVs, crossovers and pickups captured bigger shares of the market. In the five years through 2014, car transaction prices increased 8.5 percent, SUV and crossover prices rose 11 percent and luxury vehicles climbed 14 percent, TrueCar said. But net prices of pickups skyrocketed 25 percent -- up $8,039 a unit to $39,703. 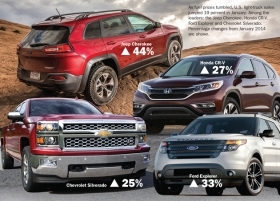 GM, Ford and FCA US dominate big pickups with 94 percent of segment sales. And GM's re-entry has enlivened the compact pickup marketplace previously controlled by the Toyota Tacoma and Nissan Frontier. But after Toyota Motor Sales' 16 percent January sales surge fueled by pickups and crossovers, trucks are on the mind of Bill Fay, Toyota Division's general manager. He said Toyota is adding Tacoma capacity in Mexico in April and tweaking its Princeton, Ind., assembly plant to build more Highlander crossovers. "We have been working hand-in-hand with the manufacturing side to really react to where the market is," Fay said. "The market's strong and it's broad-based, but we do anticipate that light trucks will continue to lead the growth as it did in 2014." Mike Colias, Richard Truett and Gabe Nelson contributed to this report.